Virtual Guitar Amp II is a guitar amp modeling and audio effects plug-in for use with VST, AudioUnits, and ProTools RTAS compatible hosts running on both Mac and Windows platforms. 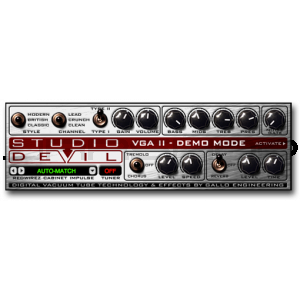 18 Preamp Models cover every range of playing styles and modeled using Studio Devil's proprietary digital vacuum tube modeling technology...nothing else sounds as real as Studio Devil because it uses exclusive and patented tube modeling algorithms! Authentic Tone Controls: Gain, Bass, Mids, Treble, and Presence controls that interact with your tone just like on real tube amps! 18 Cabinets selected from the world-renown Red Wire Impulses® collection! Noise Gate with adjustable Threshold.